Increase the power and drivability of your 675LT by optimizing the ECU. 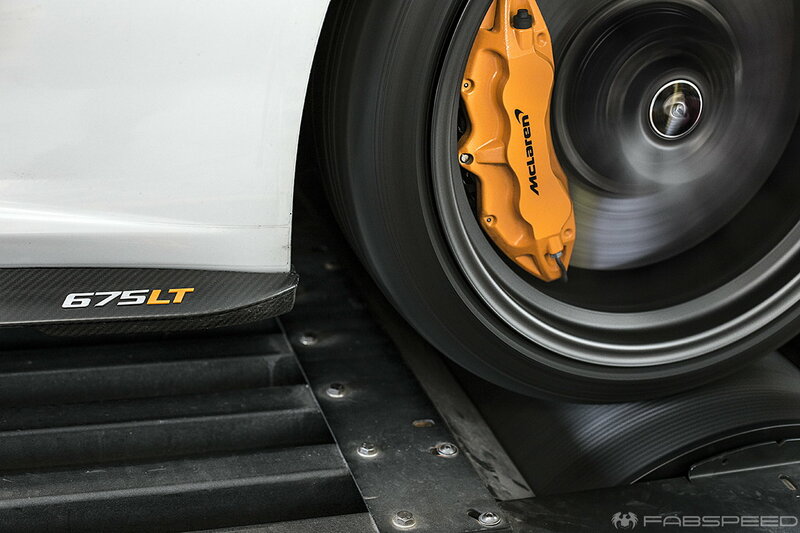 We've had ample time with 657LT's on our in-house Dynojet to unlock extra power on both stock vehicles and optimize performance with our performance downpipes. Once we receive your ECU, our tuner bench flashes it with the upgraded ECU map and we return it to you for easy reinstallation; no modifications to the vehicle are necessary. Trust Fabspeed with your baby - we've been improving McLarens since day 1 of the MP4-12C and we're dedicated enthusiasts with our own MP4-12C development car! Our top notch facility is outfitted to produce the finest exhausts and thoroughly test the results - all while extracting maximum performance with a tune to match. "Who is your tuner?" Steve has been tuning cars for many years. Steve has written software being used by many other companies. He has been the first to crack ECU's before anyone else. Thousands of vehicles are running around this world with his tunes, everything from 500 WHP Hondas to twin turbo Huracans, and your car is next. Put your faith in our tuning genius. "Will this affect my warranty or vehicle reliability?" We cannot say it will, nor that it won't. It is ultimately up to your dealership to make that call. We do extensive testing to ensure our products are reliable and engine safety is a consideration, especially with our tune. We don't craft our tunes purely for the highest numbers for bragging rights, rather the most excitement you can get without ever having to worry about a tow home from the race track. "How do I get to my ECU?" Easy. Remove the passenger side rear wheel well to expose the ECU, disconnect the harness, and pull it from the vehicle. Shipping costs for sending an ECU to Fabspeed is the responsibility of the purchaser. The ECU will be tuned within 24-48 hours of receiving it and we will then ship back the ECU overnight to US customers and expedited worldwide to our out of country friends. If you go to dealership, we can flash it back to stock – we always keep the factory file. See all information here on our website. If you have any questions - I am here to answer them! Happy New Year 675LT owners! Unlock your 675LT's true potential for 2017 with our Fabspeed ECU Tune! Many of you already know the performance benefits of tuning your 675LT, but are holding back due to concerns about reliability and driveability. Well, that is exactly why I am here! This is your time to ask any questions or voice any comments and/or concerns about our ECU Tune and I will respond to them all. Let me know if you have any questions about upgrading your 675LT! Any tips on how to remove and install the rear section exhaust?